Do you know someone who has a small business? They probably need a little help in the design and organisation areas huh? I work with small businesses and individuals to help get them organised as well as establish a brand identity. What does that mean? Why all the rhetorical questions? Well you can check out everything I do at shailongcreative.com but here’s an overview. 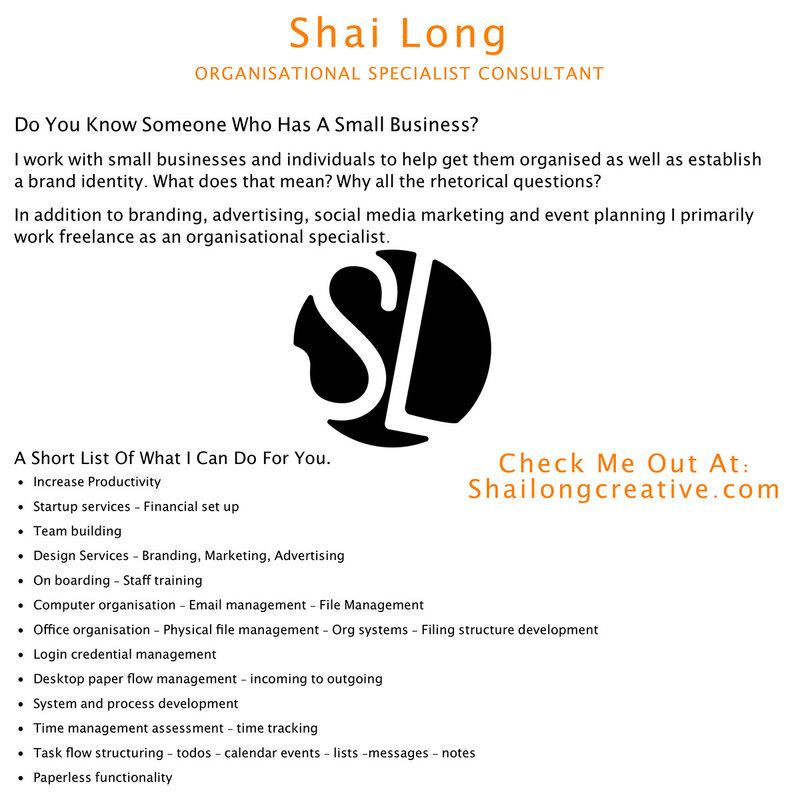 In addition to branding, advertising, social media marketing and event planning I primarily work freelance as an organisational specialist. I really feel this is something that everyone can benefit from. Because I believe when we are organised we feel better mentally and physically. I work primarily by referrals so if you know someone who can befit from my skills, kindly pass this on. Our organizing consultants will help employees develop systems so they feel in control of their workday and increase their personal productivity. We will design a paper-flow system to manage the incoming mail, handouts and paper materials that you receive. By using organizing tools, we will create a designated location for active projects, reading, pending items and other documents that require action. We will discuss how to minimize paper and increase the use of your electronic systems and mobile devices. We will sort those long-forgotten file drawers of information that is no longer needed. We will begin the process of sorting what paper can be purged and recycled. We will create a filing structure that is parallel to your electronic structure to find a place for those paper piles in your office. Ideally, keeping paper files only for quick reference and active projects and keeping all longer storage files digital. We will assess the current time management practices and habits by reviewing your current method of time tracking calendar, to-dos, phone messages, meeting notes and other miscellaneous information that often ends up scribbled on paper. We will provide best practices and alternatives to manage time and tasks better. We will discuss how to utilise your technology systems or implement new ones more effectively.